Menton Daily Photo: Let's Go Shopping! France welcomes dogs almost anywhere. No problem taking a dog to a restaurant, of course - a water bowl will be is provided. I'm not sure of the law concerning dogs in a supermarket. 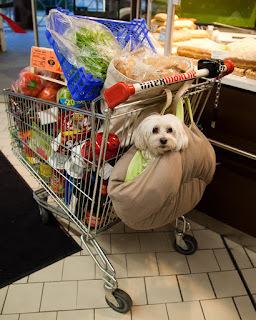 Probably not allowed and certainly I've never seen a big dog walking around a supermarket, but you often see a small pooch sitting in a bag placed inside the shopping trolley - doubtless hoping their owner will browse the dog food section. This is Danette, by the way. She's a Bichon Maltais (a Maltese Terrier) and is three years old. En France, les chiens sont accueillis presque partout. Il n'y a pas de problème si on amène un chien dans un restaurant où bien sûr - une gamelle d'eau lui sera offerte. 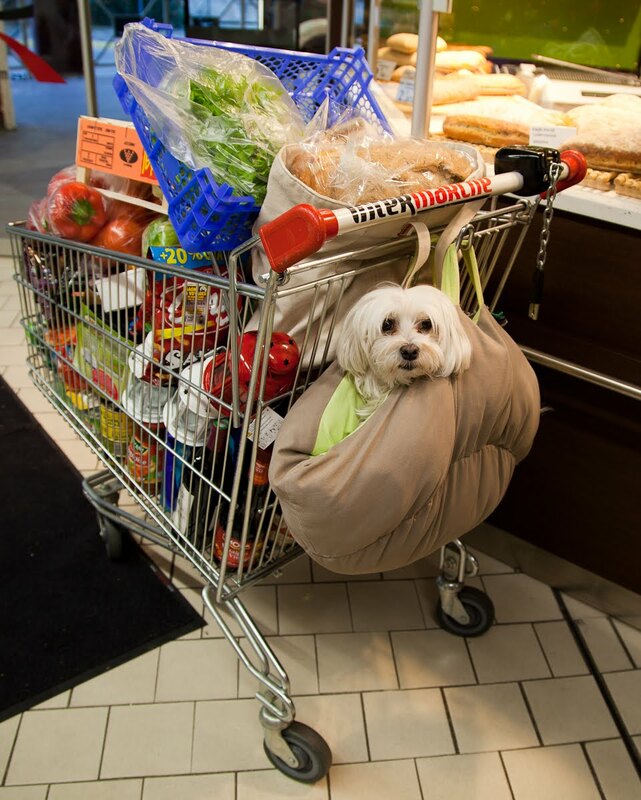 Je ne suis pas sûre de la loi concernant les chiens dans un supermarché. Ce n'est probablement pas autorisé , et je n'ai certainement jamais vu un gros chien s'y déplaçant, mais on voit souvent un petit toutou dans un sac placé à l'intérieur du chariot qui a sans doute l'espoir que son propriétaire va parcourir le rayon des aliments pour chiens. A ce propos, voici Danette. C'est un Bichon Maltais , elle a de trois ans. 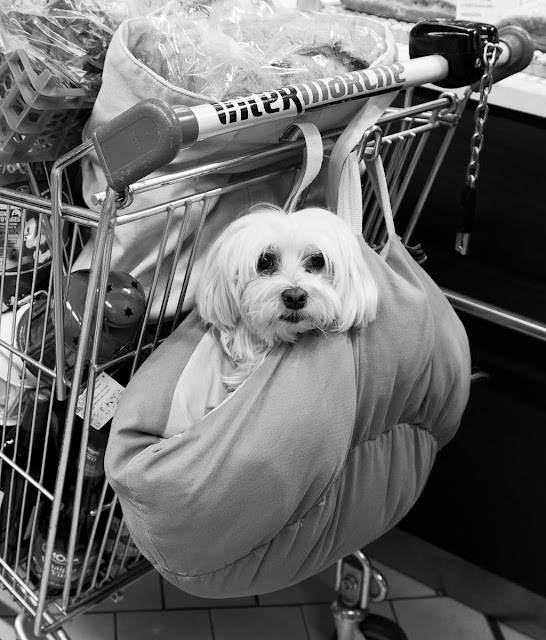 No, I have never seen any dogs in supermarkets, so I guess this is a place with other rules. i think she would be welcome anywhere. what a face. Too cute for words Jilly, what a little cutie pie! Oh, sweetkiss puppy... She's adorable and photogenic, too. I like dogs, but I have never understood why dog owners want to bring (carry) them everywhere. Yes, yes, I am American and was raised differently from Europeans . . . I think it is wonderful to allow dogs to come along almost anywhere in France. I have a theory that they are really the most intelligent species and have trained humans to meet their every need. They just let us THINK we are the more intelligent ones. Have you seen the Jack Russell Terrier we rescued from the animal shelter? We named him Pepper Jax. He is about 3 years old. Love to run like the wind. where there are more photos of him.